April is designated as Genocide Awareness and Prevention Month each year, as it marks important anniversaries for multiple acts of genocide in the 20th century. Throughout the month, individuals and organizations join together to commemorate and honor victims and survivors, educate the public about past and contemporary genocides, and advocate for prevention against future mass atrocities. Together, we seek to empower and amplify voices from across the world that have in one way or another been affected by past genocides or have taken up the challenge to combat mass atrocities in the future. To support activists as they take action in their communities this April, the Enough Project has teamed up with partner organizations i-ACT, Jewish World Watch, STAND, and others to create a Genocide Awareness and Prevention Month Toolkit. In addition to tips on planning events and utilizing media to raise awareness, the toolkit includes information on the ongoing conflicts in Burma, Central African Republic, Democratic Republic of Congo, South Sudan, Sudan, and Syria. 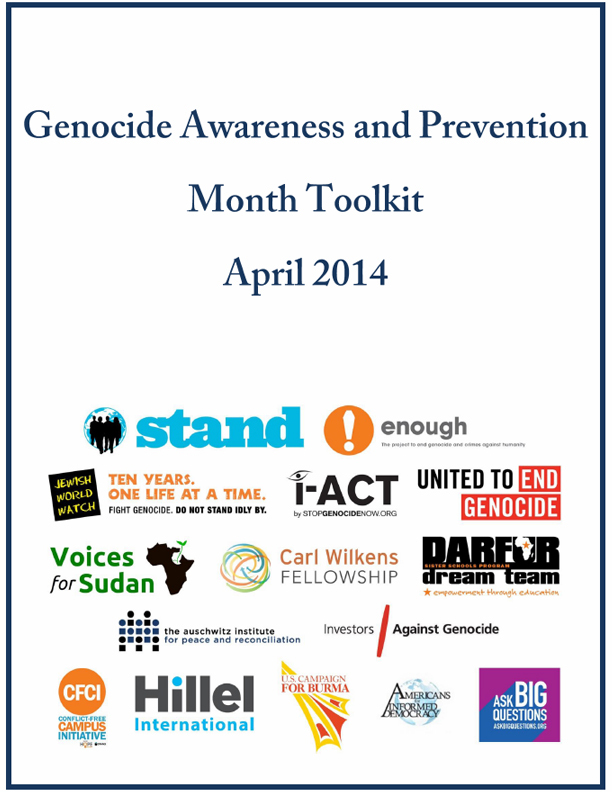 Download the Genocide Awareness and Prevention Month Toolkit to learn how you can sponsor or support advocacy and remembrance activities in your community and globally this April.